May 1998 — Sedona, Arizona. On a visit to a friend's home in Sedona, I received transmission in my ear, to look outside. 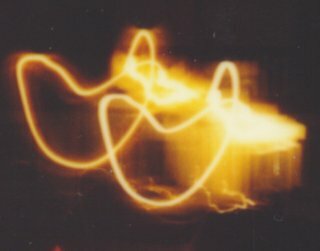 Appearing in the sky was a large light ship.... using my polaroid camera this time, I photographed into the sky. The ship is visible...but not clear enough to reproduce. But in that segment of photos, I felt the Beings in front of me, but not seeing them. 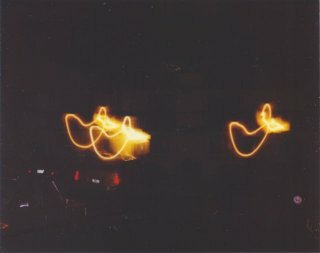 The photo below shows three interesting shapes in lights. There were two photos taken, only one showed 3 DOVE shapes. I could hear the coyotes howling, which they usually do when the ships are close.